The first time I saw watermelon radishes, I grinned. What could be more welcome amid all the leafy greens and dull root vegetables at the winter farmers market than these aptly named little gems, their bright fuchsia centers proclaiming the promise of spring to come? Not only were they cute and cheerful, they were crisp and mild, the perfect addition to a salad or a platter of cruditÃ¨s. Now, every time I see them at the market, I pick up a few. The proper name of these little roots is shinrimei. They‘re a Chinese variation on the familiar radish, sometimes labeled as Beauty Heart or even red daikon. In the market, though, they’re usually called watermelon radishes. 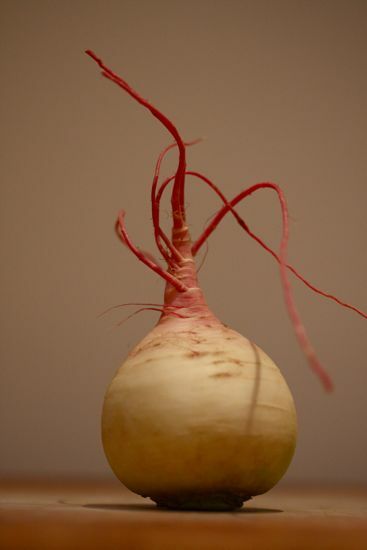 Piled on a table, they might be mistaken for small turnips, 2-3 inches in diameter with a pale green cast to their buff skin and a pink root. Indeed, they can be braised, stir-fried or roasted like baby turnips with tasty results. I prefer them raw, however, to make the most of their crunchy texture. They make a great salad with a handful of pea shoots or sprouts and a savory miso dressing sparked with ponzu. If you can’t find ponzu, a tangy soy and citrus sauce increasingly available in mainstream grocery stores, you can substitute a mixture of soy sauce, rice vinegar and lime juice. These little babies are good as pickles, too, using a sweet rice vinegar brine like the one I posted previously for carrot and daikon pickles. But you lose the distinctive watermelon pattern when the pink color bleeds into the brine. 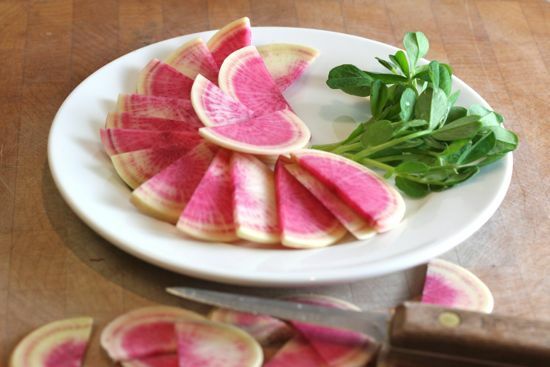 If you see watermelon radishes in the market, don’t pass them by. They perk up even the dreariest winter day. Scrub radishes, cut in half lengthwise, then slice thinly into little half moons about 1/16-inch thick. Arrange slices decoratively on two salad plates. Place half of the pea shoots or sprouts on the side of each plate or scatter over the radishes. In a small bowl, mix together the mirin, ponzu, sugar, miso, ginger and oil. Drizzle dressing over the radishes and pea shoots or sprouts and serve. Note: Mirin is a sweet Japanese rice wine. Sake with a pinch of sugar is an acceptable substitute. Ponzu is a sauce of citrus and soy. For a substitute, blend together 1 tablespoon soy sauce, 2 teaspoons rice vinegar and 1 teaspoon freshly squeezed lime or orange juice. Miso, a paste of fermented soy beans, is available at most health food stores and many mainstream grocers. Seriously cute. And I love a good miso dressing. Thanks.